Situated within 10 minute's walk of the Plaza Bib-Rambla, Granada Cathedral and the Madrasah of Granada, this 5-star elegant hotel features a jacuzzi. Guests can enjoy a sauna and an outdoor pool at this 19th-century hotel. The Hospes Palacio de los Patos provides multiple amenities including a spa & wellness centre, a Turkish steam bath and 24 hour room service. Also on offer are meeting rooms, massage services and a 24 hour reception. The hotel also provides an airport shuttle service. Rooms at the Hospes Palacio de los Patos are elegant and modern, and feature a mini bar. A TV, a telephone and a hair dryer can be found in each room of the hotel. Rooms also have an internet connection. Guests are able to wake up to a gourmet breakfast, which is served on request each morning. The hotel's elegant restaurant serves lunch and dinner. For more dining options, the hotel is surrounded by a wide range of cafés and restaurants. This Centro hotel is situated in an area popular with tourists and is about a 10 min walk from Royal Chapel of Granada. The hotel is situated a 20-minute walk from the Palacio de Exposiciones y Congresos and the Monastery of Saint Jerome. 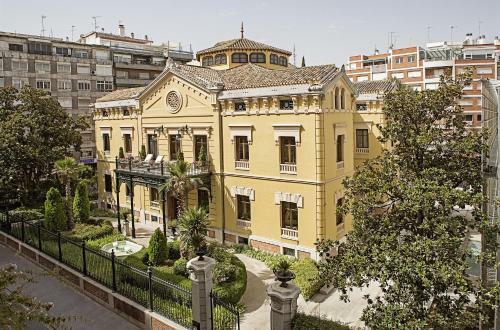 This hotel is 1660 metres from the Alhambra entrance, 787 metres from Plaza Nueva (the absolute centre of Granada), 1585 metres from the train station and 3229 metres from the bus station.